350 children and teenagers attend our school. It consists of a primary school with six grades and a high school for the grades 7 to 9. At the moment we employ almost twenty teachers. The complex comprises in total eight school houses, a canteen, bathroom facilities, a solar-powered well with a water tower, a playground, a soccer field and a vegetable garden. We opened our own school in 2004 with two buildings for eighty girls and boys. Since then we gradually extended it with regards to the local demands. The canteen with outdoor kitchen and water tower. Our initial idea was to replace an old village school that was destroyed in the civil war of 1998/99. After that the children of the surrounding villages were left with little hope for a decent education. 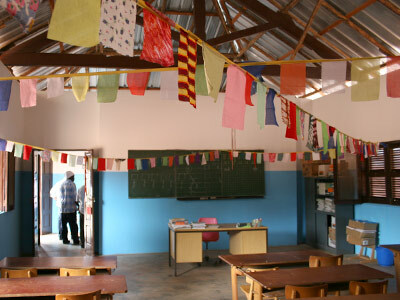 Inside view of a class room. One of the first projects was to install a solar system to produce electricity. Sometime later a water well followed of sixty meters depth. 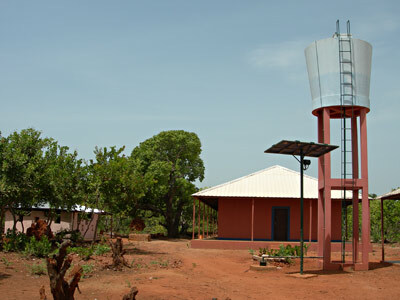 It supplies pupils, teachers and parents with fresh and healthy drinking water. 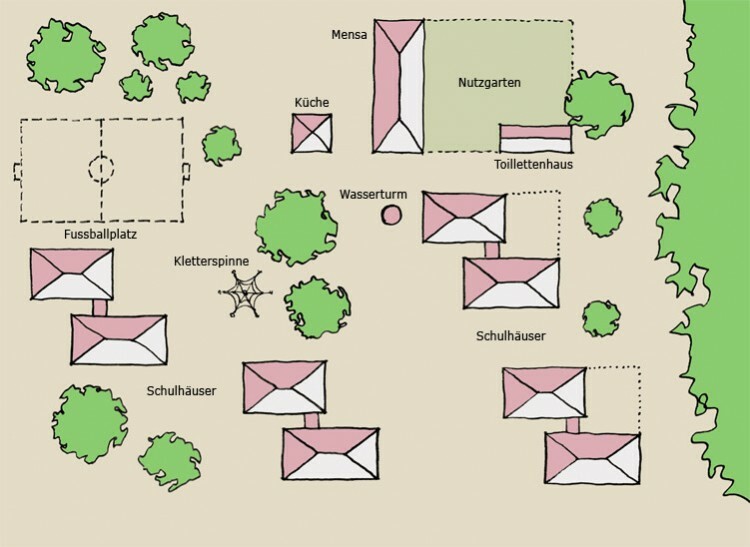 The entire plot is surrounded and secured by a large fence. Because of the generous support we received we were able to expand the school whenever it was needed. At the beginning we offered an education up to grade 4, later to grade 6 and now we are able to supplement our primary school with a high school. Furthermore we have a pre-school where the youngest children learn Portuguese. The very best of our advanced pupils have the chance to obtain a grant for a college in the capital Bissau. Our association takes over full responsibility for running and extending the school. We can guarantee that your donation will reach our school directly and safely.